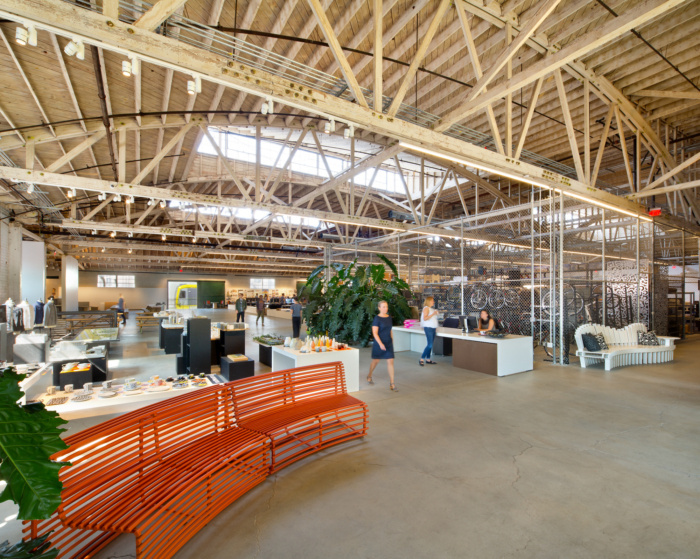 Located in a 32,000 foot bow truss warehouse in Los Angeles, Rios Clementi Hale Studios' open air office environment is fit for architects to create and implement new design ideas. Rios Clementi Hale Studios has created a multidisciplinary space for their new offices located Los Angeles, California. When Rios Clementi Hale Studios sought a new home office location in Los Angeles, no stone was left unturned. From former roller rinks to warehouses, the effort prioritized the luxury of having ample space to be creative, messy, make things, and elevate the multidisciplinary work within the studios. A heat map of employee locations guided the search and led the firm to one of the most kinetic parts of Los Angeles at the edge of Leimert Park. New growth in the area attributed the 2016 introduction of Metro’s Expo line is only a foreshadowing of future growth tied to the Metro expansion blocks away that will connect the Expo line to Los Angeles International Airport. The 32,000 square foot bow truss building is the size of a football field, with the only walls existing to carve out a host of meeting rooms that can accommodate everything from a private phone call to a conference with an entire construction team. The space gives RCHS room to think bigger by fueling a desire to explore new design methods and harness new technologies to build the future. The grittiness of the space is intentional and uses a “light touch” to allow the old warehouse character and the genuine feeling of the neighborhood’s industrial history to remain a primary feature. The warehouse look is also functional; the loading dock is in use nearly every day for everything from food trucks to ensuring the company’s notNeutral warehouse has full pick-pack-ship function.